Ur of the Chaldees in southern Iraq: About 6,200-6,500 years ago there existed a civilization located between the Tigris and Euphrates Rivers near the Persian Gulf. 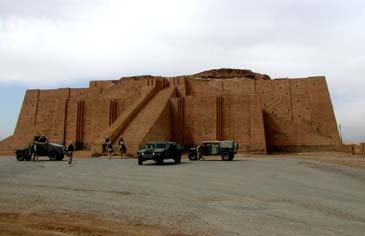 The area was known as Mesopotamia and the city was called Ur. In the West I have read daily accounts about the plight of the Palestinians at the hands of the state of Israel. This article is not about the rights or wrongs of the state of Israel; instead, it is about the forgotten history of the destruction of Judaism in the Middle East outside of the state of Israel. This in itself is very alarming and disturbing because we are talking about a community which thrived in this part of the world well before the onset of Islam. Yet even more alarming, is how this tragic story and others are being whitewashed before they have even been told to the general public. Yes, information about the destruction of Judaism and the Jewish legacy will be widely known in Israel and in certain American circles; but for people like me, brought up in the United Kingdom, I can not recall this brutal and tragic reality. Therefore, I am very grateful to Reut R. Cohen and other distinguished writers who are informing me about a history which is being neglected within the mass media in general. Also, if we ignore the “ethnic cleansing” of Judaism in Iraq then we are going to enable the ongoing “ethnic cleansing” of other minorities in Iraq. For sadly, in modern day Iraq the endless persecution of Christians, Shabaks, Mandaeans, Yazidis, and other minorities, is taking place. Therefore, the destruction of Judaism is important because the ongoing destruction of other minorities is happening and Assyrian Christianity and others are facing the wrath of Islam in modern day Iraq. Turning back to the Jews of Iraq then I will focus on the article written by Reut R. Cohen who wrote an article called “The Persecution of Jews in Iraq” which was published on her website on January 26, 2009. Therefore, we are talking about a community with a rich and cherished history and one which runs deep within the veins of Iraq itself. For just like the Assyrians, we are talking about two ethnic groups which were part and parcel of a great civilization and both ethnic groups have a rich history but both suffered deeply after the Islamic conquests of Iraq. Today, you only have 7 Jews left in modern day Iraq and apparently they have to hide their Jewish identity because of Islamic intolerance. Meanwhile, Assyrian Christians and other minorities are being persecuted in modern day Iraq and just like the Jewish legacy which is being dismantled brick by brick in Iraq; the Assyrians face the same fate but the world remains mainly silent. Turning back to history once more the Islamic conquest enforced dhimmitude on all non-Muslims and Christians, Jews, and others, were forced to accept their dhimmi status or face the consequences of slavery or death. Others chose to convert to Islam in order to escape such open discrimination and during harsh times the tax levies on non-Muslims gathered in further converts to Islam because they just wanted to escape their endless misery. Endless numbers of massacres took place over the centuries against all non-Muslims and much depended on the ruler because despite open discrimination which was based on dhimmitude, it is clear that persecution ebbed and flowed. For example, when the Turks re-conquered Iraq in 1638 it is claimed that around 10% of the Ottoman army was Jewish. However, in time the Ottoman Empire would also lead to brutal times and pogroms and systematic persecution took place against Jews, Christians, and other minorities. Reut R. Cohen continues by stating that older members of her family witnessed harrowing scenes. This applies to pregnant Jewish women being raped and then mutilated. While her great-grandfather had to pretend to be Muslim in order to safeguard his entire family. She also adds that the British “did not intervene or seem to care about what was happening to the Jewish community.” This also brings back memories of how Western powers ignored the Armenian Christian and Assyrian Christian genocide in 1915 in modern day Turkey. The same period also witnessed the Greek Orthodox tragedy and Syrian Orthodox tragedy because the genocide of Christians in Turkey embroiled the entire Christian community. In 1950 and 1951 the Iraqi parliament allowed the government of Israel and the Jewish Agency to airlift approximately 110,000 Jews during Operations Ezra and Nehemiah. 18,000 Kurdish Jews were part of these operations and a further number of Jews were smuggled out of Iraq via Iran. For Jews left behind their dwindling numbers did not help because 11 Jews were hanged in public in 1968 and new anti-Jewish measures were taken. It was abundantly clear by now that the Jews of Iraq were nearing the end and it is now estimated that only 7 Jews remain in modern day Iraq. However, for some Islamists this is not good enough and now　Ezekiel’s tomb at Kifel is in the process or being completely Islamized under “allegations of renovation.” It would appear, however, that renovation applies to dismantling all Jewish traces and this reminds me of the destruction of all Buddhist monuments in Afghanistan. The article by Reut R. Cohen also relates with ongoing events today. After all, the tragedy that struck the Jewish community in Iraq is now happening with increasing force against all non-Muslims. Therefore, the rich history of Assyria and Assyrian Christianity is under threat and the same applies to other minorities, notably the Shabaks, Mandaeans, and Yazidis.